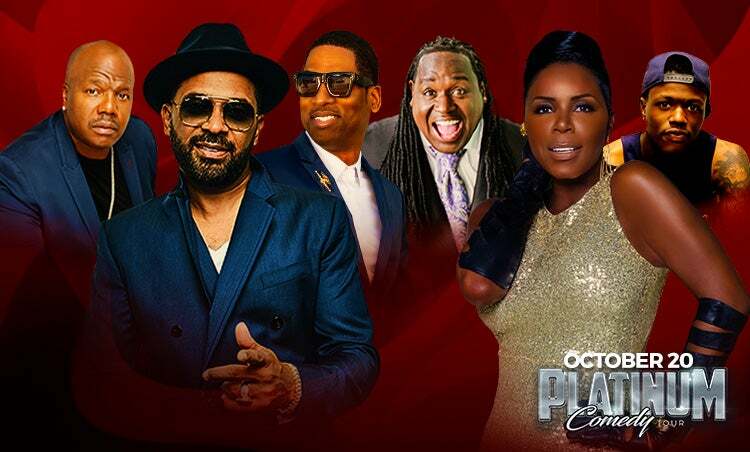 PLATINUM COMEDY TOUR FEATURING MIKE EPPS, TONY ROCK, DC YOUNG FLY, EARTHQUAKE, BRUCE BRUCE, SOMMORE. Mike Epps Official Bio: Mike Epps has generated an extraordinary amount of buzz among his peers within the entertainment industry for being one of the funniest comic actors toe emerge in the Hollywood scene as of late. 2008 proved to be an impressive year for Epps. In February, Epps appeared in the Universal Studios ensemble comedy “Welcome Home Roscoe Jenkins,” opposite Martin Lawrence, James Earl Jones and Joy Bryant. In April 2008, he appeared in the indie film “The Grand,” directed by Zak Penn and starring Woody Harrelson and Cheryl Hines. He can also be seen in the following 2008 releases: MGM’s “Soul Men” starring Samuel L. Jackson, Bernie Mac and Issac Hayes; Sony Pictures’ “Hancock” starring Will Smith and Charlize Theron and “Open Season 2” in which he lends his voice. Upcoming, Epps re-teams with Ice Cube to star in “Janky Promoters,” a comedy about two shady concert promoters (Cube and Epps) who get into hot water when their chance to book a superstar rapper goes awry. “Janky” is due in theateres March 2009. Epps will also star oppositve Mos Def in the dark comedy, “Next Day Air,” which is set to release in May 2009. In 2007, Epps reprised his role as ‘LJ’ in Sony’s futuristic action franchise, “Resident Evil: Extinction,” which placed number one at thte box office for two consecutive weeks in September ‘07. Epps also had as small but dramatic role alongside Don Cheadle in “Talk to Me” for Focus Features in August 2007. When Epps isn’t filming, he is touring the country and performing his comedy act, The Mike Epps on the Edge Tour to sold-out theaters and arenas across the country. Last year Mike’s one hour comedy special, “Inappropriate Behavior” aired on HBO and was one of the network’s top-rated one-hour specials of the year, followed by its subsequent DVD release that same month. Later that fall, Mike transitioned from his HBO comedy special to hosting duties as the new host of HBO’s Def Comedy Jam, which aired on September 10, 2006. Since 2000, Epss’ comedic film roles have exploded. In March 2002 Epps was seen starting opposite Ice Cube in New Line Cinema’s “All About the Benjamins.” Epps also reprised his role as Day-Day in “Friday After Next,” the third installment of the “Friday” series. In 2003, Epps appeared in the Paramount comedy, “The Fighting Temptations” alongside Cuba Gooding Jr. and Beyonce Knowles, and in 2004 he played the comedic relief as a loud mouthed garbage manin Fox Searchlight’s “Roll Bounce,” a film set in the late 1970s about the rollerskating lifestyle which also starred Bow Wow, Chi McBride, and Nick Cannon. Mike then went on to play a pivotal role in the Focus Features romantic comedy, “Something New,” starring Sanaa Lathan as a black career woman who unexpectedly finds love with a white working-class man, played by Simon Baker. Earlier that same year, Epps starred in two classic remakes — first Epps was seen in Columbia Pictures’ well received, “Guess Who”, starring Ashton Kutcher and Bernie Mac which was released in March of ‘05. He then starred in Paramount Picture’s remake of “The Honeymooners,” in which he played comedic legend Ed Norton, alongside Cedric the Entertainer as Ralph Kramden. A native of Indiana who has steadily climbed his way up the stand-up comedy ranks for the last seven years, Epps’ comedic talent was recognized by a national audience in 1995 when he appeared on the Def Comedy Jam tour and appeared on HGO’s Def Comedy Jam broadcasts. Epps moved to Los Angeles after his successful performance at the 1999 Laffapalooza festival in Atlanta. During his performance at LA’s Comedy Store, Epps caught the attention of Ice Cube. This led to him being cast int he co-starring role of Day-Day in his feature film debut, 2000’s hit comedy “Next Friday.” Epps has also appeared in “Bait” with Jamie Foxx, “How High” with Method Man and Redman and was the voice of Sonny in “Dr. Dolittle 2.” Epps currently resides in Los Angeles. Born in Trenton, New Jersey, Sommore has had a meteoric rise to the top of her field and has been a trailblazer for women in the comedy business. She was the first woman to host BET’s ”Comic View,” presiding over the 1994-1995 season, and in 1995, she received the Richard Pryor Award for Comic of the Year. She also has hosted Russell Simmons’ “Def Comedy Jam,” and “Showtime at the Apollo.” She was part of the record-breaking “Queens of Comedy” tour in 2000, which garnered Sommore a wider fan base and got her registered in Guinness’ Book of World Records when she performed to a captivated audience of more than 50,000 people in Atlanta, Georgia. The 2001 made-for-television movie based on that tour was the highest-rated and longest running special in the history of the Showtime Network. Never one to rest on her laurels, Sommore was a featured comic in the “Latham Entertainment Presents” tour in 2002, where she was the only woman performer. Sommore has been a featured guest on “The Oprah Winfrey Show,” “The Tonight Show with Jay Leno,” “The View,” and “Politically Incorrect with Bill Maher.” She was interviewed on CNN Headline News about her phenomenal artistic and financial success as a comedienne, and was profiled in Comedy Central’s “Special Women in Comedy” program. Other noteworthy accomplishments for Sommore include several appearances on the sitcoms “The Hughleys” and “The Parkers,” HBO’s “SNAPS” and MTV’s “Wild ‘N Out.” Sommore also participated in season six of VH1’s “Celebrity Fit Club”, Comedy Central’s “Roast of Flavor Flav,” and was a regular on NBC’s game show “1 vs. 100” during the 2008 season. More than a comedienne, Sommore is a writer, producer, and entrepreneur. She wrote and produced “The Queen Stands Alone,” a filmed version of her stand-up act, which debut on Comedy Central in September 2008 to over 800,000 viewers. The DVD is currently in stores and is one of the best sellers among stand-up films. In 2010, Sommore was invited to participate in Chicago’s “Just for Laughs Comedy Festival” as a featured act on the “Cedric the Entertainer’s Urban Circus” which aired on TBS. There she performed alongside the likes of other comedic greats such as Jerry Seinfeld, Chris Rock, Steve Harvey and Cedric the Entertainer. Sommore was also featured on the very successful “Royal Comedy Tour” where she was the first female comedienne to Headline over other male Nationally Headlining acts. The tour is currently gearing up to go back out in 2011 and Sommore is looking forward to once again headlining the show and proving to others that she belongs. In addition, she is the producer of a documentary, which is currently in production and she is developing several projects for television. Sommore earned a bachelor’s degree in business administration and mathematics from Morris Brown College in Atlanta. Before she became a comedy star, she taught algebra in the Atlanta public school system, and owned and operated several businesses in Atlanta, including a clothing store, a shoe store, and a store that featured imported food and specialty products from Africa. Sommore has found success in nearly every area of the entertainment industry. She continues to be in high demand for film roles and television appearances. She plans to expand her role as a writer and producer of comedy, documentary films, and television programs. In addition, she has been involved with several hip-hop projects, including videos and recordings. However, her greatest love continues to be her first love—stand-up comedy. She is currently gearing up to once again Headline the very successful “Royal Comedy Tour” which debuted in early 2010 to rave reviews. It was also the first time that a female comedian has been featured as the headlining act over other nationally known male headliners. A feat that she Sommore continues to hone her skills and expand her reputation as a comedienne, performing to sold-out audiences across the country in both large arenas including the world famous Radio City Music Hall and Madison Square Garden in New York City and Universal Amphitheatre in Los Angeles, as well as at premiere comedy clubs such as Caroline’s on Broadway in New York and the world famous Improv’s. With her fresh approach to comedy, her distinctive style, and her groundbreaking accomplishments in the entertainment industry, she is a true “Queen of Comedy,” – a title she plans to hold for years to come. Tony Rock’s Official Bio: Comedian, Actor, Producer Tony Rock is the hardest working man in show business. Born in the same Brooklyn Hospital where most of his eight brothers and sisters arrived into the world, Tony was born laughing and it was quickly apparent that his big brother wasn't going to be the only famous comedian in the family. proven to prov. Tony has proven to be one of television's best hosts having played the role of ringleader on HBO’s weekly stand-up comedy series All Def Comedy, NBA TV's The Warm Up, along with BET’s Black Card Revoked and Apollo Live, all while co-starring in his first primetime network series - CBS' Living Biblically. DC Young Fly’s Official Bio: American rapper, actor, and Internet personality DC Young Fly combines music with comedy. D.C. Young Fly is an actor and writer, known for Armed (2018), Almost Christmas (2016) and My Cousin's Ghetto Wedding. Born John Whitfield in Atlanta, Georgia, he started rapping in 2011, partially to honor his late brother. Years later, he began producing comedy videos that were uploaded online, roasting figures like Drake and Kevin Hart. In 2014, he made his debut with the single "Westside Connection," which he soon followed with "M.A.P." In 2016, he issued "Right Now" and "No Weed." During this time, he also appeared on multiple seasons of the MTV improv comedy show Wild 'n Out, joining the cast from 2013 to 2017. He would continue his relationship with the music network, becoming one of the hosts of their Total Request Live reboot, which premiered in late 2017. That same year, The 85 South Live Variety Show, an album culled from material from his podcast with Karlous Miller and Clayton English, was issued. Bruce Bruce Official Bio: Bruce Bruce is a name synonymous with keeping audiences rolling with laughter thanks to his captivating improv skills and larger than life comedic style. Bruce’s steady style of comedy has been showcased across the country, and he has been entertaining audiences young and old, and of all backgrounds, for years. His wit, spontaneity and dazzling personality set him apart from other standup comedians. Although Bruce is known for his adult comedy, he prides himself on not using vulgarity to win a laugh, and is no stranger is winning over new audiences with every appearance he makes. Earthquake’s Official Bio: Earthquake is an explosive comedic performer unlike any other. His stand-up comedy is at its peak, his ability to engage an audience is nationally known and he is now being heralded by critics as one of the most talented comedians in the country. And now...television executives have taken notice. In 2004 Earthquake signed a deal with Touchstone Television/ABC to develop and star in his own sitcom AND this year he has a deal with HBO to develop and star in his own sitcom along with a 30 minute stand-up special to be shot in New York City late April 2005.